All About Myrtle Beach Personal Water Crafts and Jet Ski Rentals? Action Water Sportz | Jet Ski Rentals Myrtle Beach > Jet Skis > All About Myrtle Beach Personal Water Crafts and Jet Ski Rentals? You have your plans set that you are going to rent a jet ski when you go out on your summer vacations in Myrtle Beach. But, do you really know anything about personal water crafts? In Myrtle Beach, renting a jet ski is very different from renting a car, it depends on your experience with operations. You may need to undergo a training session to learn the fundamentals of riding a personal water craft and the local rules relating to the safe operating procedures. Renting a personal water craft in Myrtle Beach is an affordable way to make your vacation a memorable one for your family and friends. If you want to do something fun, Jet Ski rentals are easily available and are usually affordable enough for a family vacation or even spring break with friends. Besides being a cheap way of making your vacation spectacular, riding it will also prove to be one of the most exhilarating experiences of your life because there are very few things in the world that can give you the high that you can get when riding the waves on an ocean front as you feel a water spray on your face. You can navigate to the middle of a water body with these personal watercrafts to enjoy the serenity and the calmness around you. 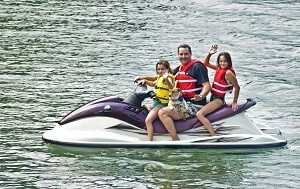 Having your personal watercraft is fun but it may too expensive and you may have problems with transportation. Wave Runner, Sea Doo, and a Jet Ski are all brand names for vehicles that are known as personal watercrafts. Even though, the products of different companies may vary in their looks, the principle, and operating procedure is almost the same for all water crafts. These vehicles are like snow mobiles or motorcycles that operate on water. Can you just rent a personal water craft from a Jet Ski rental business? If you have a credit card and a valid driver’s license, you can rent it from just about any location that you want. Action Water Sportz in Myrtle Beach provides this kind of service so you can have fun with your family and friends. There is a minimum age limit of 16 years for the operation of personal watercrafts in most states; however, the Jet Ski rental establishment may impose a higher minimum age limit of 21 years to rent it from their establishment. Most business will also want you to take the lesson on operating Jet Skis, the safety procedures, and local regulations; while many offer training sessions at lower rates with the possibility of one free lesson. Unless you have considerable experience in operating a ski in the city or state, it is recommended that you attend at least a few of these classes. For how long can I rent a jet ski? Action Water Sports jet ski can be rented for an hour to a few days, if this is your first time renting a personal watercraft, you may want to rent it for a days and see if you enjoy the ride; although chances are that after one day, you may want to ride your jet skis every day.